To sign up to the Pink Apple Designer Furniture Newsletter, simply click the Request Newsletter button below and you will receive amazing special offers, discounts and access to secret sales. 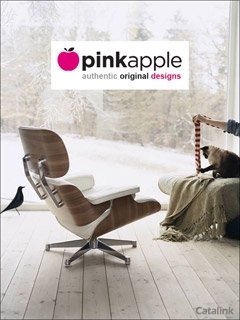 Pink Apple offer sleek contemporary furniture and innovative lighting solutions. Whether to revolutionise your interior spaces or treat yourself to a spectacular new sofa, this newsletter brings you essential makeover tips, product updates and first-come sales to bring you closer to the home of your dreams. An intuitive website, friendly customer service and phenomenal value all combine to deliver one of the best homemakeover experiences you'll find anywhere online. Sign up to the Pink Apple newsletter for savings and tips to help you craft the perfect home. By Pressing the Request Newsletter button you give Pink Apple Designer Furniture (and their Data Processors for the specific purpose of delivering your emails) consent to send you their newsletter via email until such time as you choose to unsubscribe.